Could Facebook take on Google Home and Amazon Echo one day? Putting our goals of reading a certain number of books or running a half-marathon in perspective, Facebook CEO Mark Zuckerberg's self-imposed challenge for 2016 was to build himself an AI to help automate his home. Now that the year is coming to a close (sighs of relief all around, we're sure), Zuckerberg shared the results from his Iron Man-style Jarvis project. Coding got Zuckerberg where he is today, so we'd imagine enabling his devices to talk to each would be the easy part, right? Apparently this wasn't so. Zuckerberg mentions that getting all the devices he wanted Jarvis to connect to (which included a Sonos sound system, Samsung TV, a Nest camera, and a grey T-shirt cannon) was actually "much more complicated than I expected." Not necessarily because of all the work - Zuckerberg humblebrags that his other goal of running 365 miles this year took more time overall - but rather because of all the different coding languages, APIs, and protocols that the various smart devices used. After modifying a 1950s' toaster (since it was the only one that kept bread inside while off) and making some hardware adjustments to his aforementioned T-shirt cannon, Zuckerberg posits that for home AIs like Jarvis to really take off, there need to be more smart devices with more common APIs and standards to make the process easier going forward. When we see ads for any kind of supposedly life-changing digital assistant (you know who you are), we almost always see voice commands as the be-all, end-all way to start the coffee machine, have the news read to you, or set a reminder to pick up the kids from roller derby, etc., etc. However, Zuckerberg thinks those assistants are too quick to downplay the ol' millennial way of communicating: texting. "One thing that surprised me about my communication with Jarvis is that when I have the choice of either speaking or texting," Zuckerberg writes, "I text much more than I would have expected." He found Facebook Messenger's chatbot program especially helpful in setting up a way for him to communicate sans-vocal cords. Given how easily third-party businesses can use the same platform to do everything from call a cab to order pizza, we can see the appeal. We can also see it as an advertisement for Facebook's own AI services (the man runs a business, after all) but Zuckerberg's thoughts on text over speech aren't without credence - the CEO mentions that texting feels "less disturbing" to use around others, as well as works for more private interactions. While it started out as a personal project, Zuckerberg's stint as a real-life Tony Stark may turn out to make it back into his business in good time - or yours. The CEO name drops a lot of Facebook-owned resources he called upon while programming Jarvis. He even shares those resources in his report, from the Buck build tool to the FastText AI classification tool, creating a place to start for any interested weekend warriors looking to follow in his footsteps. Zuckerberg also mentions that building Jarvis gave him "direct experience building AI tools" that he believes will become very relevant, very soon. 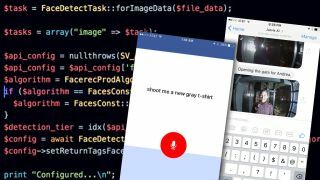 He is already looking to port the app he made to control Jarvis from iOS to Android, on top of adding more devices and functions to the ever-learning robo-butler. Though he decided not to open source the code for his project - feeling it was tied too tightly to his own home - Zuckerberg may release his work later on, should he make a more open-ended version of his AI. Finally - and most attention-grabbingly - Zuckerberg writes that an improved framework for Jarvis could also one day "be a great foundation to build a new product," implying that if he takes his hobby far enough, we may wind up seeing Facebook's take on the likes of Google Home and Amazon Echo in the not-so-far-off future. That, or a Facebook-branded automated T-shirt cannon. We'll see.